It is very common these days to hear that the global economy has no way of recovering because the most powerful engine of global demand – the American consumer – is choking in debt. US household debt has reached $14 trillion in 2009, or 100% relative to GDP. At a recent conference in China, panelists were wondering how growth in the global economy would resume given that the American consumer had disappeared under the burden of debt. On September 17, the Federal Reserve released their “Flow of Funds” report, where we can find data on household debt for 2009Q2. Indeed, this debt stands at $14.068 trillion or slightly less than 100% of GDP. Does this mean that the economy is doomed? There are two points that one has to take into account when evaluating the role of household debt in the economy. But maybe it is the composition of debt that matters – people today live off their credit cards. It turns out that consumer credit has increased indeed over the past 20 years but the numbers are not shocking. From about 14% in 1990, consumer credit rose to 17.3% in 2009 (again the numbers are relative to GDP). 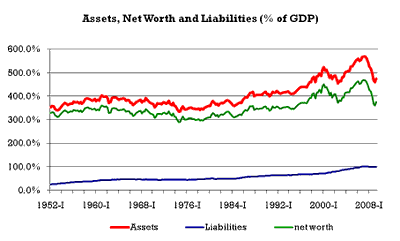 One counter-argument to the points that I raise above would be that all of this wealth is only on paper – we saw how bubbles deflate and therefore we cannot count $67.2 trillion is assets at their face value. To accept this argument, however, we must admit that the real estate bubble has not deflated yet. It could be true, but looking at data we find that house prices relative to income are close to their historical averages from the pre-bubble 1980s and 1990s. In other words, an argument that the wealth is only paper wealth should argue that the US is in a permanent state of a bubble. 2. Even if we concede that debt can reduce consumption for an individual, it is a bit trickier to make the same argument for the national economy. The reason is that the liability of one individual is an asset for someone else. In the graph above, the thin blue line is in fact included in the thick red line! At first, it might be startling to think that indebtedness of one household is an asset of another one. But if you imagine a bank and its balance sheet, you can quickly realize that all the loans that banks give (assets for the bank) must be financed with a deposit, equity or another instrument on the liability side. Ilian Mihov is a professor of economics at INSEAD. He has taught in the MBA, EMBA, PhD and various EDP programs. His areas of teaching include business cycles, monetary and fiscal policy, long-term economic growth, and exchange rate determination. In the PhD program professor Mihov teaches time series analysis, introductory and advanced econometrics and probability theory. For his teaching in the MBA program he won the Best Teacher Award in 2006. Professor Mihov's research is primarily in the fields of monetary and fiscal policies, economic growth and political economy. He has co-authored several papers with the Federal Reserve Chairman Ben S. Bernanke. Professor Mihov's papers have appeared in many academic journals such as Quarterly Journal of Economics, Journal of International Economics, Journal of Money, Credit and Banking, etc. His work has been presented and discussed at many policy-making institutions such as the Fed, ECB, the World Bank and the IMF. Ilian is also a research professor at the German Institute for Economic Research (DIW Berlin) and a research fellow at the Center for Economic Policy Research (London, UK). Since 2002 he has served on the Scientific Committee of the Banque de France's Research Foundation. Professor Mihov is also an associate editor at the Journal of the European Economic Association and Macroeconomic Dynamics. In 2006 he was awarded the Distinguished Young Alumnus award by the Moore School of Business at the University of South Carolina. Professor Mihov earned his M.A. and Ph.D. from Princeton University, and B.Sc. from University of South Carolina. Is The Credit System Broken?